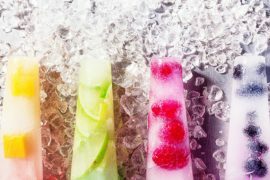 Whether you need them to cool down or treat yourself after a workout, here are four healthy Popsicle recipes that will help you just when you need them most! These delicious treats are bound to please any crowd without the sugary crash, and they are easy enough to make if you’re in need of something that doesn’t do any damage to a workout or a diet. So, let’s get started on those Popsicles! Using a food processor, blend the strawberries, lemon juice, and Manuka honey until smooth. Pour the puree into molds or cups with wooden spoons at the middle of each. Freeze the Popsicles until they are solid. Place all of the ingredients into a blender and blend until the mixture is completely smooth. Pour the mixture into a couple of pop molds and freeze overnight or until they have completely frozen. Remove them from their molds by carefully running hot water on the outside of the mold for 20-30 seconds. Blend the mango, orange juice, coconut milk, Manuka honey, and vanilla extract until smooth. Fill the ice-pop molds and then freeze. Using a blender, add peanut butter, milk, yogurt, vanilla extract, and 2 tablespoons of Manuka honey. Blend the ingredients until smooth. Fill the Popsicle molds partially with the peanut butter mixture and freeze it for an hour. Again, fill the Popsicle molds partway with raspberry juice and some raspberries. Insert the sticks and freeze the molds for an hour. One more time, fill the molds with the remaining peanut butter mixture. Freeze overnight or for at least 8 hours. Take the Popsicles out of the freezer and let them stand for a few minutes at room temperature before taking them out of the molds. Add in the remaining Manuka honey at the bottom of each treat and coat them with sesame seeds.